Quality Assurance Department establish the the necessary requirements to guarantee the stability and accuracy of the products, by considering customers opinion along with long term experience and technology of OSK as an expert in manufacturing Gear Measuring Instruments and feed back to the quality check process during the manufacturing of them. For the calibration of gage blocks, gears and gear inspection instruments, Gear Measurement Center offers service and support to the customers as a calibration laboratory. 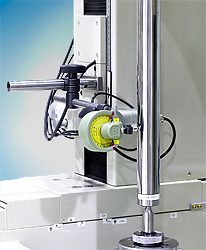 Precision Measurement using Mikrokator, precision dial indicator.